Judgment and Decision Making is a refreshingly accessible text that explores the wide variety of ways people make judgments. It examines assessments of probability, frequency and causation; as well as how decisions are rendered under conditions of risk and uncertainty. Topics covered include dynamic, everyday and group decision making; individual differences; and the nature of mind and brain in relation to judgment and decision making. Offering up-to-date theoretical coverage, including perspectives from evolutionary psychology and neuroscience, this volume has everything a psychology student needs for BPS accreditation, whilst drawing out the practical applications for non-psychology students with plentiful examples from business, economics, sport, law and medicine. 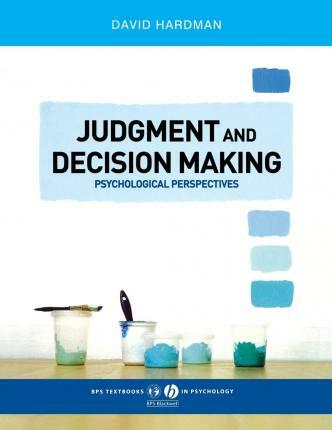 The latest addition to the BPS Textbooks in Psychology series, this thorough text provides a succinct, reader-friendly account of the field of judgment and decision making. David Hardman has taught judgment and decision making at London Metropolitan University since 1998, where he is Principal Lecturer for Learning Development. He is co-editor of Thinking: Psychological Perspectives on Reasoning, Judgment, and Decision Making, and is an Associate Editor for the Journal of Economic Psychology.